Fuller is pleased to announce that Sebastian Kim has been appointed executive director of the Korean Studies Center and professor of theology and public life beginning July 1, 2017. 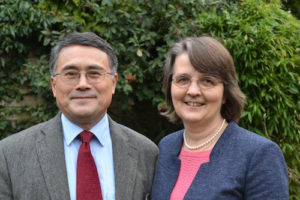 Dr. Kirsteen Kim, his wife, will join the School of Intercultural Studies faculty as professor of theology and world Christianity also on July 1. Kim comes to Fuller from York St John University in the UK, where he taught for 12 years as the chair in Theology and Public Life in the School of Humanities, Religion, and Philosophy. He is currently also a University Head of Research and director of the Centre for Religion in Society. Prior to joining York St John University, he was director of Christianity in Asia and taught world Christianity in the Faculty of Divinity at the University of Cambridge. He also taught at Union Biblical Seminary in India, and was interim director of the Henry Martyn Centre and Henry Martyn Lecturer at the Cambridge Theological Federation. Born and raised in South Korea, Kim completed a BS in electronic communication engineering from Hanyang University. He served as a programmer and systems analyst before responding to God’s call to join Korean Harbor Evangelism and World Concern Korea in Seoul. He continued his mission work as dean of the Cross-Cultural Missionary Training Institute, home director for World Concern Korea, and mission partner of the Presbyterian Church of Korea. Kim’s scholarship interests include public theology, world Christianity, Asian theologies, and theology and peace building. He has authored four books, including A History of Korean Christianity, Theology in the Public Sphere: Public Theology as a Catalyst for Open Debate, and In Search of Identity: Debates on Religious Conversion in India. Books he has edited include Mediating Peace: Reconciliation through Arts, Music and Film; Cosmopolitanism, Religion, and the Public Sphere; Building Communities of Reconciliation: Reflections on the Life and Teaching of Reverend Kyung-Chik Han; and Christian Theology in Asia. Kim is a fellow of Royal Asiatic Society, executive committee member of the Global Network for Public Theology, member of the Society for Study of Theology, and editor of the International Journal of Public Theology. The recently launched Korean Studies Center is the newest expression of Fuller’s devotion to Korean churches and its focus to extend its educational programs and research resources to a growing Korean church in the US and around the world. The Korean Studies Center will contribute to Fuller’s mission through dedication to building faithful, courageous, innovative, and fruitful Christian leaders for Korean churches, missions, communities, and cultures. The Korean Studies Center aims to contribute to the development of Korean churches, missions, communities, and cultures by continuous academic, social, and spiritual development of students, faculty, and graduates in relation to Korean churches, and through the continuing relationship between Fuller Theological Seminary and the Korean churches scattered around the world. Fuller Theological Seminary is deeply committed to serving the church in Korea and our Korean community. We are very grateful for our strong history in serving the Korean church and in the significant number of alumni who have studied at Fuller in Korean, English, and Spanish. The Korean Studies Center offers the following degrees: Master of Arts in Intercultural Studies (MAICS), Master of Theology in Missiology (ThM), Doctor of Ministry in Global Ministries (DMin GM), Doctor of Ministry (DMin), and Doctor of Missiology (DMiss). 풀러는 2017년 7월 1일을 기해 김창환(Sebastian Kim) 박사가 코리안센터의 원장(executive director of the Korean Studies Center) 및 신학과 공공 영역 교수(professor of theology and public life)로 부임하며, 또한 부인 커스틴 김(Kirsteen Kim) 박사 역시 같은 날 선교대학원 소속 신학과 세계 기독교 교수(professor of theology and world Christianity)로 부임하게 되었다는 기쁜 소식을 전합니다. 김 박사는 영국의 요크 세인트존 대학교 인문, 종교, 철학 대학에서 신학과 공공 영역의 석좌교수로 12년 간 재직하였습니다. 또한 현재 동 대학의 대학연구총괄 교수 및 부설 종교와 사회연구소(Center for Religion in Society)의 원장을 맡고 있습니다. 그 이전에는 케임브리지 대학교 신학부에서 세계 기독교 교수로 재직하며, 아시아 기독교 연구소(Christianity in Asia)의 원장을 역임했습니다. 그 외에도 인도의 UBS 신학교(Union Biblical Seminary)의 초빙교수로, 케임브리지 신학대학연합(Cambridge Theological Federation) 소속 헨리 마틴 연구소(Henry Martyn Centre)의 임시 원장으로, 헨리 마틴 강사로 섬겼습니다. 김 박사는 대한민국 서울에서 자랐으며, 한양대학교에서 전자커뮤니케이션공학으로 학사 학위를 받았습니다. 이후 프로그래머 및 시스템 분석가로 일하던 중 하나님의 부르심을 따라 서울 소재 한국외항선교회와 한국 World Concern 선교회에 참여하게 되었습니다. 이후 한국외항선교회 산하 타문화권선교사훈련원의 원장, 한국 World Concern의 본부 책임자, 대한예수교장로회 (통합)에 소속되어서 선교 사역을 지속했습니다. 김 박사가 학문적으로 관심을 갖고 있는 분야는 공공 신학, 세계 기독교, 아시아 신학, 신학과 평화 등입니다. 네 권의 책을 저술하였는데 《A History of Korean Christianity (한국 기독교 역사)》, 《Theology in the Public Sphere: Public Theology as a Catalyst for Open Debate (공공 영역의 신학: 열린 대화의 촉매로서 공공 신학)》, 《In Search of Identity: Debates on Religious Conversion in India (정체성을 찾아서: 인도에서의 개종에 관한 논의)》 등입니다. 그 외에 편집자로서 엮은 책으로는 《Mediating Peace: Reconciliation through Arts, Music, and Film (평화 중재: 예술, 음악, 영화를 통한 화해)》, 《Cosmopolitanism, Religion, and the Public Sphere (세계주의, 종교, 공공 영역)》, 《Building Communities of Reconciliation: Reflections on the Life and Teaching of Reverence Kyung-Chik Han (화해의 공동체 구축: 한경직 목사의 삶과 가르침에 대한 성찰)》, 《Christian Theology in Asia (아시아 기독교 신학)》 등이 있습니다. 김 박사는 또 영국 왕립아세아학회(Royal Asiatic Society)의 회원, 국제공공신학학회(Global Network for Public Theology)의 집행위원회 위원, 영국 신학연구회(Society for Study of Theology)의 회원, 국제공공신학학회지(International Journal of Public Theology)의 편집장으로 활동하고 있습니다. 최근에 설립된 코리안센터는 한국 교회를 향한 풀러의 오랜 헌신의 가장 새로운 결실입니다. 코리안센터의 목표는 미국과 전세계에서 성장하고 있는 한국 교회에 맞춰 교육 프로그램과 연구 자원을 확장하는 것입니다. 풀러는 한인 교회, 한인 선교회, 한인 공동체, 한인 문화를 섬길 신실하고, 담대하고, 혁신적이고, 협력하고, 결실하는 기독교 지도자 양성에 헌신하고 있으며, 코리안센터는 이 일에 기여할 것입니다. 코리안센터는 한인 교회와 관련된 학생, 교수, 졸업생이 학문적, 사회적, 영적으로 계속 성장하도록 도울 뿐 아니라, 전 세계에 흩어져 있는 한인 교회가 풀러와의 지속적인 관계 가운데 발전하도록 도울 것입니다. 풀러신학교는 한국 교회와 우리 한인 공동체를 섬기는 일에 깊이 헌신하고 있습니다. 풀러는 그간 한국 교회를 섬겨온 견실한 역사, 그리고 한국어, 영어, 스페인어 프로그램에서 수많은 동문을 배출한 역사를 감사하게 생각합니다. 코리안센터에서 한국어로 제공되는 학위과정은 다음과 같습니다: 선교문학 석사 (MAICS), 선교신학 석사 (Th.M), 선교목회학 박사( DMin GM), 목회학 박사( DMin), 선교학 박사 (DMiss).